Works well on cutting the glass into oval in different sizes. The vertical cutting plotter had been already installed for the application of masking, but it was inefficient when dealign with the bigger size of the sheet. Also, it was efficient to put Retack sheet directly on the glass and cut, while putting the masking sheet on the Retack sheet and cut, and put the cut masking sheet on the glass again. Cutting the glass directly will be great, if possible. Rectangle and circle can be cut by automated machine. However, in case of oval for the mirror, the size varies, so the mold for each size is needed. After that, put the masking sheet (white and yellow) on the glass and cut the sheet. ●After cutting, rip the sheet off. The next process is the sand blasting. The creation of the data is easy, so there is no problem with putting sheet on the glass after cutting the sheet by the vertical cutting plotter. 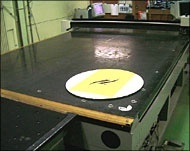 However, this approach makes the alignment difficult, so put the round glass on the origin of the plotter, and cut. The manual glass cutting processing needs molds for all the shape except for rectangle and circle. CF-2025G performs great ability in cutting, especailly for the oval in defferent sizes. Send the CAD data to the computer, and cut by CF-2025G immediately. This way of cutting is described as "Scoring" in industry term. This process is to take glass off in oval by incising the base line. With this method, the glass of the 10mm thick can be cut. CF-2025G does not require proficient skills, and cuts in the intended shape. After installed one cutting plotter, we introduced another one exclusive use for glass cutting, after a year and a half passed.